In 4&apos;s, 2 feeders and 2 players in the middle. Feeders practice throw-ins, vary combinations, look to set back or open out and switch. Progress to groups of 8 working in pairs to create space and change the direction play qucikly. 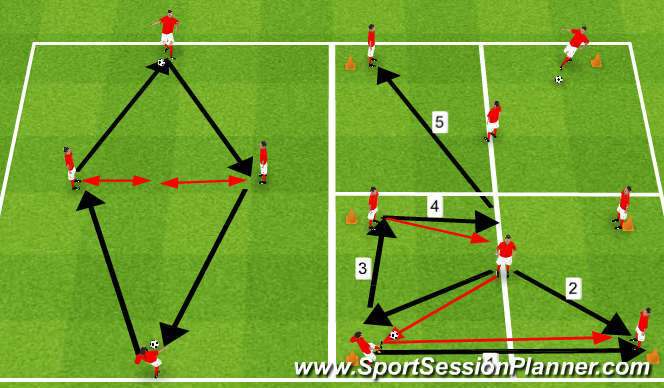 In groups of 8, practice quick 1-touch play, practice improves awareness and weight of pass. 1 player in the hole, 3 v3 + 3 floating players. Maintain possession, keep it quick, sharp and support. Ensure that players communicate correctly. they switch. 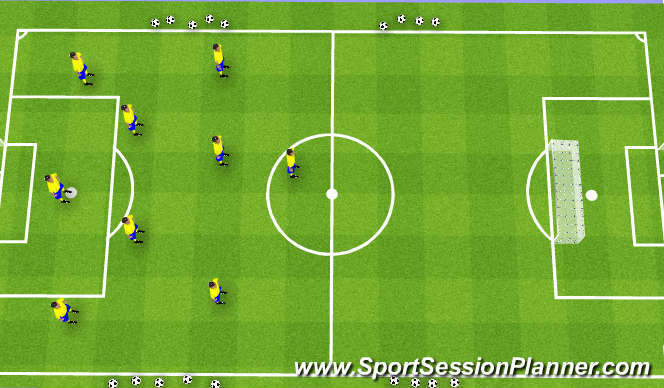 After both teams have completed the passes and transferred the play then they can finish. Progress, open the play up and go to 3 v 3 + 3, 5 passes before you can score. Team shape-switching the play, using throw-ins and different passing combinations. Use a 3-2-4-1 formation as only 9 players.